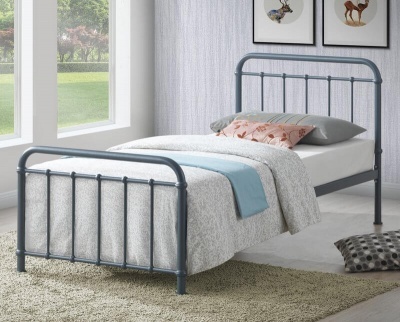 Curved head and foot boards with simple detailing give a designer look to the bed frame. Great choice for modern interiors. Hardwood legs contrast with the bright aluminium frame elegantly. The Aztec bed frame has a sprung slatted base for added comfort and mattress life. Premier: Ideal choice for guest bedrooms and children's beds. A coil sprung mattress with medium firmness. DAmask cover. 13.5 bonnell spring unit, plastic side edge supports, 900 gsm spring insulator and 270 gsm polyester filing. Depth 18 cm. All of the mattresses have been made in the UK. Fits a standard UK single 90 x 190 cm mattress. Delivered in two boxes and a wrapped mattress if purchased. Part of our selection of bedroom furniture.